In the summer of 2017 a friend of mine, who had moved to Eastern Europe, reached out and asked something like "I know that you know a lot of lawyers. Getting the right things done is hard. I have never met a professional who does not struggle with it. The pace of modern life and business has quickened, the margin for error is smaller, and the pressure to produce results has increased. I have studied the subject of personal productivity extensively. Mostly because being focused and productive do not come naturally for me. I've joked since the 90s that "If it weren't for spell-check and my day-planner, I would have to push the hamburger buttons at McDonald's." FranklinCovey company has a great system for Daily Time & Task Management, and we have been sending our employees through their programs for almost two decades. But I have yet to find a fully "engineered" system for translating "big-picture" goals, project management milestones, and individual action steps, into a reliable system for getting the right things done in our business; so I created my own. Living in a way that integrates our values, big picture goals, plans and projects with your daily time and task management system is hard. I hope this helps. It's the best I have come up with so far. Everyone should agree that it is better to do the right thing slowly rather than doing the wrong thing fast, but how do we know if we are “digging in the right place” or not? The answer is Weekly Planning and daily focus on that plan. I have found that the best time for me to do this is the weekend before the upcoming week (except for Sunday night right before bed, which is a terrible idea if you're really busy), but any regularly scheduled time is probably OK.
Let's be clear: This is "a" system, not "THE" system. It is one way that works for some people. If it does not work for you, then this system should at least be some help in developing your own system that allows you to exercise dominion over your schedule, rather than being a victim to the million little pieces of our work lives that can enslave us. For PFCS, the measure of success is simple: Can you consistently show up to our Weekly Staff Meeting with a plan for the next week that includes a schedule of where you are going to be, a list of what you have due, and an estimate of your available time. Milestone: An event that marks the completion of a Deliverable, a Hold-Point on a schedule, or a flag in the Project Plan to highlight completed work; often used to ensure project progress. 10. Deliverable: A measurable, tangible item produced during project execution. Some are external and subject to approval, but some are internal only. Big Rocks: The most important things you have to accomplish. If you have not watched the Big Rocks Video by Franklin Covey, do so. It's awesome and 10-minutes very well spent. See the link in Awesome Resources at the bottom of this article. 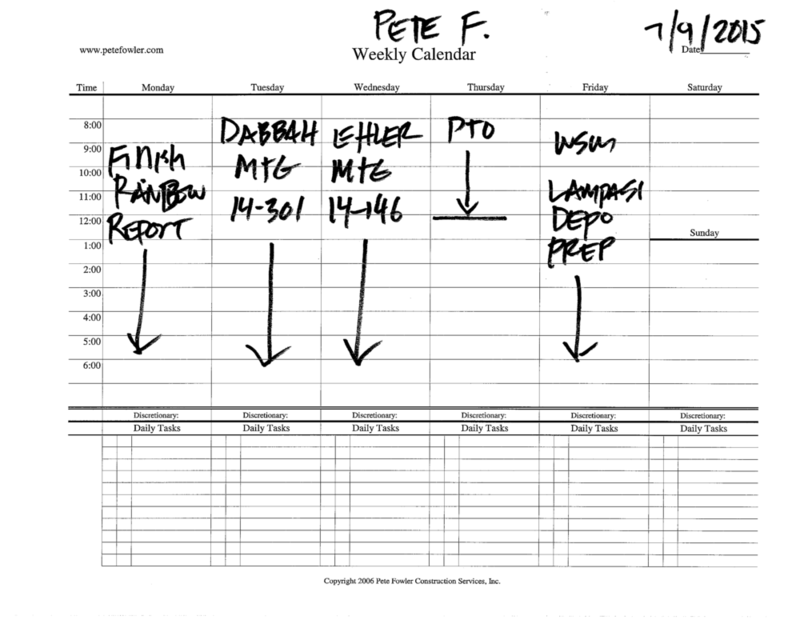 To use this weekly planning system, first set aside time to plan the week ahead, print the Weekly Planning form, and either print a Weekly Calendar or use your normal calendar. Quickly review and summarize your (1.) Values, (2.) Mission and big-picture (3.) Goals. (4.) Compile and review your previous Weekly Plan, calculate the percentage of success for the last period, Project Plans and (5.) Master Task List (MTL), adding critical activities, Deliverables and Milestones to your Weekly Planning form as you go. Make sure all your (6.) "Hard Calendar" appointments are blocked-out on your Weekly Calendar and calculate the amount of (7.) "Discretionary Time" available for completing your critical Deliverable and Milestone activities. (8.) Estimate the duration of time required to complete each of the Deliverables and Milestones identified on the Weekly Planning form, and prioritize each, first by categorizing with an A, B or C, and then sequentially numbering within each category. (9.) "Soft Calendar" (apply) each of the activities required to accomplish the Deliverables and Milestones identified on the Weekly Planning form, to the Weekly Calendar. Finally, exercise discipline on a daily basis to in taking (10.) action in working toward accomplishing what is most important. Values: Same every week. Write Values as a weekly reminder. Mission: Same every week. Write Mission as a weekly reminder. Goals: Annual and Quarterly goals. Plans: Project Plans and Goals / Plans with many Actions. Review the previous week's Weekly Plan. Calculate your percentage of successes based on completion of Milestones / Deliverables. Forward incomplete items to the Master Task List (MTL) for re-prioritization. As an example, you should have a Project Plan for every PFCS project under management. In addition, you might have a plan to get a certification or degree that has many incremental steps. You might have a Fitness Plan that has many steps. Any multi-step project that is worth doing is worth having a written plan. In order to make sure you decide well which tasks you will get accomplished, you need to collect all of your plans and review them from "above the game". Get perspective on where you can and should spend your valuable time. Master Task List (MTL): Keep a separate list of all the tasks you need to complete. This is not the same as your Daily Tasks or the Weekly Plan. Discretionary Time: Calculate the number of work hours you have available, subtracting Hard Calendar items. For example, if Monday of next week is a holiday (40-8=32), you have an inspection all day Tuesday (32-8=24), a half-day meeting on Wednesday (24-4=20) and the Weekly Staff Meeting (20-1=19), you only have 19 hours of discretionary time. Milestones: Milestones, Deliverables or "Big Rocks" as Stephen Covey says: Add them to the Weekly Planning sheet. Include an estimate of how much time this task will take. Once you have all of the items you think you might be able to accomplish in the week, during your discretionary time, prioritize them; first with letters A, B or C. A is critical and you should not do any thing else until this is complete. B is a really important milestone or deliverable and should be completed but the world would not stop spinning if you did not. C would be really great to do, but not until all of the A and B items are complete. Soft Calendar: Put blocks of time (in pencil) on the Weekly Calendar to complete the activities from your Weekly Plan list of Milestones / Deliverables / Big Rocks. Action: Exercise the discipline to return often, at least once daily, to the Weekly Plan. Stay focused on the tasks as you prioritized them. These steps are repeated weekly and daily. Remember: The Weekly Planning process is iterative. If you have been through the Franklin Covey Focus course, then this will be easy; just review your list of personal values. Everyone will come face-to-face with difficult situations. Sometimes we have to tell people no. Values help us to make hard decisions. Making explicit our values makes the decision making a little easier. We all have values that we will not violate for money or career advancement. What are yours? The funny thing is, we earn more respect in the end for making hard decisions that are consistent with our values. Consider reviewing PFCS Core Values. Why are you here (both in general and here at PFCS)? This is the question that is answered with your mission and purpose. If you have been through the Franklin Covey Focus (or similar) course, then this will be easy; just review your Personal Mission. Naturally, almost every person and business will have to spend some significant amount of time doing the work that “pays the bills.” For some, this is directly “on-mission” but for most, we have to squeeze in the work of moving closer to the fulfillment of our mission. When we have a written mission, we can look at our Weekly Plan and decide if we are dedicating enough time to the fulfilling our mission. We are more apt to take the many steps in our 1,000 mile journey toward fulfillment of our mission if we revisit that mission every week. If you have been through the Franklin Covey Focus (or similar) course, then this will be easy; just review your Personal Goals. Some of your Professional Goals with PFCS have been identified already in your Job Description and KPIs: Project Planning and Management, shipment of Deliverables, Billable Hours, Training Milestones, etc… Keep this list handy and review it every week during your planning time. For each Goal or PFCS Project you should have a Project Plan that identifies the Objective, Method, Deliverables / Milestones / Big Rocks, and Actions required to achieve it (see PFCS Project Planning for a step-by-step method). Review and prioritize your Plans. You will or should have a Master Task List (MTL) in your planner for things that you need to do which are not on a Project Plan. Review and prioritize your MTL. Add items from your MTL to the PFCS Weekly Planning Form. Hard Calendar items are items blocked out on your calendar for things like meetings with clients or other activities with firm dates and times (also see Soft Calendar items below). Review your Hard Calendar items and confirm them. These items are time specific and relatively inflexible. Include travel time in your calendar. Discretionary Time is working hours that are not consumed with Hard Calendar items. Calculate Discretionary Time by adding up your working hours that are not consumed with Hard Calendar items. This is time you have available to work on Deliverables / Milestones / Big Rocks. The milestones should come from the Deliverables section of your Project Plans, Life Plan, Annual Plan, Quarterly Plan, and from your Master Task List (MTL). Deliverables / Milestones / Big Rocks are what you need to accomplish this week. When you see house movers load a truck, they always put the big stuff in first (i.e Big Rocks) and then fill in the truck with the smaller items. If done in reverse, the big stuff simply won't fit very well, if at all. Don’t put the small stuff in first. That is how life and success works too. Within each category (ABC), assign a number corresponding to the chronological order things need to happen in. Soft Calendar items are time you block out of Discretionary Time to work on Deliverables / Milestones / Big Rocks that you need to accomplish this week. This is in contrast to Hard Calendar items, discussed above. If something critical comes up, it is easy to re-shuffle Soft Calendar items, as long as the deadline is not too close for that that Deliverable / Milestone / Big Rock. These are items that are time-flexible; that is, they don't need to be done at the time set on the calendar. Exercise discipline in keeping to the plan. Refer to and revisit the Weekly Plan and Daily Task List many times per day and throughout the week to help you stay focused. If something comes up that makes you vary from plan, then change the plan. Document what you spend your time on. "Crashing is the technique to use when fast tracking has not saved enough time on the schedule. It is a technique in which resources are added to the project for the least cost possible. Cost and schedule tradeoffs are analyzed to determine how to obtain the greatest amount of compression for the least incremental cost." we might "add resources" (a project management term and strategy) by delegating some of the work to others. What ever you decide, neither The Hope Method or The Prayer Method are acceptable. Weekly Plan: Without this, you can get lost in the forest of daily planning. Daily Task List: This is on our Weekly Planning Form, but if you don't use it, you'll need a permanent place that you look to often throughout your day to keep focused (or in my case, to constantly re-direct myself back to the plan). This material was originally written and published as an internal company training back in 2007, or maybe even before. So of course there are changes in technology. Also, my role has been evolving from individual contributor, with a BUNCH of little tasks that needed to be accomplished, to the leader of a larger group. As the leader of a larger group, it's become more important that I accomplish a small number of critical things, compared to my role as an individual worker. I have a written Life Plan in Google Docs that gets updated every few years (It's 3 years old right now. I have done this many times throughout my life. The more I plan and the more I revisit my plans the more successful I am. During the times in my life that I have not looked at or updated my Life Plan, I have been less successful. I highly recommend using Keith Ferrazzi's 6 Steps to Set Your Goals for Success. I have a Daily Meditation that I review often, although not daily. When I find myself off-track, reviewing this every day is a great way to get me focused. I used to spend some time between Christmas and New Year's to review the previous year's plan and update the plan for the year to come. I am going to get back to doing this. I have sometimes done this for my personal planning, but I get too busy to update them every quarter. For business, we create Quarterly Plans for the Business, Marketing & Sales, and Information Technology, each with a list of the 3-9 Big Rocks from the previous quarter on a single PowerPoint slide and how we performed compared to those goals, then we list 3-9 SMART Big Rocks for the current quarter on a single PowerPoint slide, then each of the Big Rocks gets it's own individual presentation slide with sub-items, actions or milestones that will lead or contribute to accomplishing that objective. In 2018 we will have quarterly plans for each of the following: Business (over-all), Marketing, Finance, Operations Management, Technical Management, Information Technology. We have a very structured project planning method and set of electronic tools. See OMMA-Goodness!™ Project Management Framework: In-Brief by Peter D. Fowler Copyright 2008. I am using SimpleNote (simplenote.com). See notes in Weekly Plan below. I now use a shared Google Calendar. For many years I used a paper calendar, and if I were working alone and the calendar did not need to be shared, I would return to it. I have gone back and forth from electronic to paper planning and back many times. I don't know that I will ever stop going back and forth. I think I might just be a person who needs something new from time to time. When I am using a paper journal, I screen shot and print the weekly view of my Google Calendar and tape it into the paper journal on the page opposite my Milestones/Deliverables/Big Rocks page. Right this minute I am using SimpleNote (simplenote.com). It synchronizes with cloud so I can open it as a tab on my desktop or laptop, as well use it from any hand-held device (I use an iPhone). It's like a really slimmed-down version of Evernote. It's text only, and I like it that way. I have had a couple instances where I lost some data due to synchronization problems, but I think those qualified as "Operator Errors." The point is that it, like any other system, is not foolproof. My Weekly Plans and Daily Task Lists are in the same page or file in SimpleNote. This is not ideal for me, and I am seriously considering going back to a paper journal, because paper is more visual and my learning style is to write things out and look at them. When I was last using a paper journal, I would purchase various hard-bound journals with lined pages. I draw the Milestones/Deliverables/Big Rocks & Planning Steps on a full page and I screen shot and print the weekly view of my Google Calendar and tape it into the paper journal on the page opposite my Milestones/Deliverables/Big Rocks page. I am using SimpleNote (simplenote.com). See notes in Weekly Plan above. I am seriously considering going back to a paper journal. Each month gets it's own Journal page/file/document in SimpleNote. I number each note I take throughout each day. The second note I take on the 15th day of each month would be numbered "15 b." So if I write down thoughts about a new blog post, and I want to make a note in my MTL for easy reference I would write "Blog Notes: See 2017-10-15 b." And I would know to go to the second journal note from 10/15/2017. This is in no particular order (which is SO unlike me!). The Effective Executive by Peter Drucker. Drucker is the Godfather of management theory, and this book is his seminal work. If you're a manager or trying to be more effective as an individual, and you have not ready it, then you're not trying hard enough. Here is an interesting 7-minute summary video. Goldman Sachs 10,000 Small Businesses: If you're a business owner, I HIGHLY recommend this program. I have done lots of executive education and it's the best so far; and it's FREE! The conclusion of the 4-month program is that you compose a business plan focused on growth that they call your "Growth Plan." One-Page Personal Plan (OPPP) from Scaling Up and Verne Harnish. To Do Doing Done by G. Lynne Snead and Joyce Wycoff. I love this book and think it's awesome. I have been inspired significantly by this book called How To Write by Meyer & Meyer. It’s excellent and the paperback can be purchased for as little as $1.99 or downloaded to your Kindle for $5.49 on Amazon. I assure you: This is the very best ROI on an investment in yourself in human history. Buy the book. Read the book. Do what the book says to do. Writing is critical. Writing is a process. The writing process is always the same 3 steps (organize, draft, polish). Don’t try to do step 2 until you have completed step 1. Some of the steps in writing involve not writing. Figuring out the theme (in a few short sentences) is a critical step and might require some time. Writing takes tenacity. We are entitled to our own opinions but not our own facts. Be clear and concise and cut unnecessary stuff. Use an established layout. Read the work out loud to check for grammar. If there is time, always review the work one more time. Communicating your intended meaning to the reader is the most important thing. Buy this book. Read it. Use this process as a checklist when you write. Literally: Print out the list and tape it to the wall at your desk. Are you getting tired of listening to the same silly pop songs on the radio while you're stuck in traffic on your way to and from work? So were we! Ever since one of our employees discovered the "Speak Screen" feature on the iPhone, sitting in traffic has never been the same. To make the best of time spent commuting (and to keep yourself from having to look down at your phone while driving! ), have your iPhone read out loud to you. By enabling the setting called "Speak Screen," your phone will read the words on your device out loud. Open the Settings application on your iPhone. It looks like the image on the right. Under Settings, click General, located at the bottom of the page. Under General, click Accessibility, located towards the bottom of the page. In the Accessibility folder, click on Speech. It is located in the middle of the page. Finally, to get your iPhone to read to you, turn on Speak Screen. All of the settings within the Speech folder will help to adjust the speed and tone of voice your phone will use to speak aloud. Last, but not least, close out of Settings and navigate to a page with text (ex: a web article, your text messages, etc.). Drag three fingers from the top of your screen and your iPhone will begin to read to you. Audible is an Amazon application that allows you to download and listen to audiobooks, radio and TV programs, and audio editions of newspapers and magazines. To use Audible, make sure you have an active Amazon account. Then, simply download the Audible application to your phone or computer and browse the shop – the first 30 days are FREE! Pocket is an application that our president, Pete Fowler, swears by. This app was originally intended for desktop computers and went by the name "Read It Later." Once you have downloaded Pocket, it allows you to search for articles across the internet that interest you. The best part is that you can save the articles to read at a later time (hence, Read It Later...) or as we prefer – to listen to later! Pocket has features to adjust the size of the text for easy reading, but more importantly, it can play the articles aloud for you. Using your phone and driving is dangerous. Using Speak Screen or applications like Audible or Pocket keep you entertained while your eyes remain on the road. Next time you're in the car and need something to listen to, sign in to PFCS Client Access and tune in to one of our past webinars! Pete Fowler Construction Services is trying to improve our social media presence by incorporating the use of a social media management tool for the Marketing Team's convenience. As PFCS's Social Media Manager, I spent some time researching the best platform for the company to utilize. It is important for the company to use a program that is both cost and time-effective and allows some flexibility and creativity with the content of the posts. After scanning multiple articles, it became clear that Hootsuite is the highest ranked and most popular, overall. Hootsuite is preferred over similar programs because there is a feature that allows the user to interact with their news feeds directly inside of the application. Throughout my research, I was keeping a close eye on Buffer because it had been recommended to PFCS by another company's Social Media Manager. However, I wasn't consistently seeing Buffer in the top three websites listed in articles, like I was with Hootsuite. The article "15 Tools Every Social Media Manager Should Use" listed Buffer at number six saying, "It's particularly useful for small businesses that don't have the time or resources to update their social media channels regularly, but would still like to maintain a social presence." Upon reading this article, I realized I needed to narrow my search and get a closer look at which site would be best for a small business like PFCS. After limiting my search, I found that the top three social media management sites for small businesses were consistently Agorapulse, Sprout Social and Buffer. In the cases where Agorapulse and Sprout Social were favored, it is because the two sites allow feed browsing and interaction inside the application. On the other hand, Buffer's simple intention is to build a social media queue and the user is required to open the specific social media platform to browse and interact with the news feed. Following my research, I decided that Buffer is the best social media management site for PFCS because it allows freedom to customize posts and still set up a consistent queue on all relevant social media forms. I will start using Buffer to manage PFCS's social media and report back in a month! After messing around with Buffer and doing further research, I have chosen to accept defeat make the switch to Hootsuite. Hootsuite is the #1 recommended social media management site for a reason. The "Professional" account package on Hootsuite offers more posts, more account access and better analytics for the same price as Buffer's "Awesome" account package. Sounds like a deal to me! Everyone who was an adult before the 1990's remembers that cars used to breakdown regularly. Think back. It happened a lot. So what has changed? Why are we no longer using call boxes on the side of the freeway so often? Well... other than the fact that we all now have mobile phones ;) It was quality management in manufacturing that finally took root in America. Back then it was called Total Quality Management (TQM) and was taught to the Japanese after WWII by Americans like W. Edwards Deming and Joseph M. Juran. It got bad for a while here in the U.S. In the 1970s and '80s Toyota and other Japanese manufacturer's almost killed the American auto industry with their inexpensive cars that used less gas and were more reliable. It took massive initiatives for the American auto industry to catch up. Ford had their famous "Quality is Job 1" campaign and there was even a popular and funny, but very serious, '80s movie called Gung Ho that told the story of the culture-shock American workers endured in making the change to a zero-defect mindset. A lot has changed in the American economy and workforce since the 1980s. Far fewer of us are making things. Most people work in offices and type on computers all day. But much of what was learned about "quality management" is only now being translated and put to use in modern "knowledge work." Today's complex professional services businesses like software makers, attorneys, and "consultants" (like PFCS), are working on projects just as complex as automobiles or other manufactured products. But this modern work is being performed with a production system similar to the way old time craftsmen worked, relying on "judgement" and "experience" rather than engineered systems that include measurement of productivity and quality, with continuous improvement built in. Defective products are not sent to subsequent processes. The result is 100% defect-free goods. By limiting the work in process (WIP) at each step in the process, Kanban naturally exposes bottlenecks. These previously hidden bottlenecks can be opened, thus increasing the rate of the system's throughput. Around 2010 Kanban started being applied to software development. In manufacturing of physical products, "visual management" is easy, because you can see the work by walking to the work area and following the physical flow of the process. In knowledge work, the fundamental "Visualize the workflow" (i.e. Visual Management) is less natural, but creating a visual management system dramatically increases the ease of understanding of the process and progress toward the objective. The power of Kanban changes the game even more dramatically when processes can (or need to) run in parallel, and the work of multiple processes is combined at various points in the process. We know that professional services (generally) can be delivered with a much higher level of quality than they currently are; that is, faster, better, cheaper, more consistent. We want to create a system for increasing quality, improving consistency (decreasing variability), and continuously improving. We are already a really good consultancy. But it's our intention to be a great one; truly world-class. Like a professional services "solutions factory" for building problems. We think this manufacturing facility analogy is perfect (take a look at this video of the Tesla factory). "Problems" come into our "factory" and "solutions" are the resulting product that is manufactured inside and delivered to the customer, defect-free. We know from our studies in quality management (including TQM, Lean, Lean Six Sigma) that using Kanban to control the process flow is a tool that will work for us. It's our intention to make a kanban system for world-class delivery of professional services. In our system, the technical consultants are the "customers" that come to the supermarket and our project coordinators keep the shelves stocked. A client of ours is the owner and manager of a multi-family residential project who needed to hire and manage a new on-site maintenance person. In one sitting we created a system that solved many of their issues. See the "To Do, Doing, Done" Kanban Board at the top of this post. We recommended they create a 4-foot tall, 6-foot wide board with these 3 simple columns. The maintenance person creates a "Kanban Card" (Work Order) for every service call, email, or written request for maintenance. This Kanban Card (Work Order) is placed in the To Do column of the big Kanban Board. The maintenance person prioritizes for the week and day by placing the highest priority cards at the top of the To Do column. Every day work orders are moved into the Doing column for the projects in process. At the end of the day, Cards are filled in with Actual Duration, Actual Cost, and Completion Date. All of these work orders represent 100% of the time spent by the maintenance person. At the end of the week the work orders in the Done column are scanned and saved in the personnel file and used for payroll. Critical building maintenance information is saved into the building maintenance files to create a record that a building maintenance expert (like PFCS) can use to continuously improve the effectiveness and efficiency of the work. Since the Kanban Board was placed in the maintenance office of the community clubhouse, it created a transparent communication system that addressed concerns of the people living in the community who could now see the priorities and what was in process. Community members now negotiate with real information about prioritizing use of this expensive and important resource (the full-time maintenance person). We used our not-patent-pending Proving the Obvious Using Google method to research this post. Kanban on Wikipedia: This is good to read completely. Kanban (Development) on Wikipedia: This is a must read. What is Kanban by LeanKit: This is a great read. Image Search "Kanban" by Google. There are LOTS of great examples of kanban being applied to professional services, especially software development. A Brief Introduction to Kanban by Atlassian: This is a great read. What is Kanban by Everyday Kanban: This is a great read. Kanban Flow: Lean project management simplified. This is a good "free" (you can pay to upgrade) software tool. Kanban by Crisp: A basic introduction that includes visuals of a simple system, benefits, and lots of other resource references. Personal Kanban 101: "The human brain however, simply does not respond well to the stress of juggling multiple priorities... That’s where Personal Kanban can help... allows us to visualize the amount of work we have..." There is a 7 minute video that demonstrates the basics of using a To Do, Doing, Done personal kanban board. Steve Jobs 1990 interview video about Joseph Juran and Quality. The first 11 minutes 10 seconds (not the full 19 minutes) are key. When watching this, I am not surprised that he changed the world with technology and created in his own lifetime the most valuable company in the world. The Goal: A Process of Ongoing Improvement by Eliyahu M. Goldratt. This is considered by many the best business book ever written. It is a parable of a factory and all of it's jobs saved by process improvement. The Theory of Constraints was introduced in this book. At Pete Fowler Construction Services, we work as expert witnesses in construction defect litigation, construction claims, and property related insurance claims. Sometimes in claims and litigation matters people say silly things. They do this to try to prove their point when they run out of sensible things to say that support their opinions. Often, these silly things that people say and write are surprisingly difficult to refute from a logical and critical thinking perspective. Sometimes, refuting silly assertions can come down to our word versus theirs. So, we developed our not-patent-pending exercise, "Proving the Obvious Using Google.” The thing to remember with this application is to separate the wheat from the chaff—the expert will still need to apply professional knowledge, judgement and experience in order to make this exercise successful. An expert said that the "standard of care" in the building industry for a shower enclosure installer was that the shower enclosure should be completely 100% leak-proof and permanently sealed and no maintenance should be required. When we searched “shower enclosure standards” in Google, we found: (1.) “The Bath Enclosure Manufacturers Association is dedicated to raising consumer awareness of the advantages of bath enclosures as the quality alternative to shower curtains” (2.) That the ASTM committee, who composes the national standard, was not even addressing the issue of sealant use (3.) All sources we could find suggested inspecting sealant annually and maintaining nearly as often. We were hired by a plaintiff attorney after having represented the general contractor in a construction defect litigation matter that settled favorably to our client immediately following our deposition. The plaintiff attorney had taken an assignment of rights against the insurance company of another party and was pursuing a coverage claim, asserting that the building had not met the standard defined in the policy to be considered "collapsed." Ultimately, this was laughable, because when we entered the search term “building collapse,” almost none of the buildings on the first page of Google qualified as collapsed under the policy exclusions. In 2015, we had a case where the opposition argued that the interior of a multi-family residential repair project required three coats of paint (one primer and two top coats). Since there were many units, this made a significant difference in the cost. We searched "interior paint two coats versus three coats" and the results were virtually unanimous that under the vast majority of situations, with all but the darkest of base colors, two coats of interior paint were adequate. In 2016 and 2017 (two different cases) we were called to testify in construction litigation matters regarding the definition of "Fast Track Construction" and the impact of the concept on each of the projects. So, of course, we used our Proving the Obvious Using Google for "fast track construction" method. In the first case we were able to make clear the responsibility for the mess that had been made was mostly the responsibility of the Owner, Designer, and General Contractor for having started a project with an inadequate design. In the second matter, the Designer and General Contractor (owned by the same guy) argued as part of their defense that the project was being run as "Fast Track Construction." Unfortunately for the Owner (our client) they had no idea that the Designer-Contractor had thrust upon them responsibility for the risks inherent in Fast Track Construction. Google a simple search phrase like "shower enclosure standards," "building collapse," or "interior paint two coats versus three coats." "Print" the results page to PDF and save the file with a name beginning with the date (ex: 2015-12-06), then the search term (ex: "Building Collapse"), then "00" so it sorts at the top of this set of files you're about to compile (Example complete file name: 2015-12-06 Building Collapse 00.pdf). Open the first item in the organically returned list (non-sponsored listings). We like to open this link in a new tab in the browser by using the right-mouse-click. Either screen shot or print to PDF (whichever looks better) and save the file with a name beginning with the date (ex: 2015-12-06), then the search term (ex: "Building Collapse"), then "01" so it sorts after of this set of files you're about to compile (Example: 2015-12-06 Building Collapse 01.pdf). Go back to the Google search page and open the second item in the non-sponsored list. Either screen shot or print to PDF and save the with a name beginning with the date, then the search term, then "02" (Example: 2015-12-06 Building Collapse 02.pdf). Continue on with links 3-10. Once the 11 files are compiled, save all of the files together in a single PDF file named 2015-12-06 Building Collapse 00 COMPLETE.pdf so that it will sort at the top of the list of these files. You can then delete all of the individual files. Consider composing a memo summarizing the contents and offering commentary of "What This Means." See related post Communication of Complex Information. Google Maps provides a wide variety of functions for its users that go well beyond generating directions to and from the airport. In our office, many of our projects concern more than one location or address. “My Maps” from Google now allows you to map all of these locations in a super easy way. 1. Open “My Maps” in Google. You can do this by logging into Google, going to Google Maps and clicking on “My Maps” in the drop-down on the left of your screen. 2. Click “Create a new map” or open an existing one. 2. To upload a spreadsheet that contains your list of addresses, click “Import” in the box in the upper left hand corner. 3. Google will ask you to choose the column in your spreadsheet that identifies the placemarks (addresses) as shown below. An identical box will open next prompting you to choose the column that identifies the information you want to label these placemarks. 4. Once the information has populated, you may format the markers on the map by color or object. 6. Now you can select a specific address to stand out or add another spreadsheet of data. Being able to instantly view a map of two, 12, 35 or 50 locations will not only save an enormous amount of time, it visually scouts an area of interest and can be easily enhanced to meet your specific criteria. Also see our PFCS Events page for a list of our 2016 webinars with registration instructions. We host a monthly one-hour webinar series covering a wide variety of construction, insurance and legal industry topics. This year, we conducted a survey to find out your favorites from the past, interest for future programs we planned, and suggestions for programs that we haven't thought of yet. Below is a complete list of all our presentations, broken into five categories. Below that is a list of "Old Favorites" (most popular), Key Learning (most important to us), and the list potential topics we considered covering this year. The results are in! We published the webinar schedule for 2016 in January, and we are really excited about the content. Thank you all for the help in deciding. All of these programs are also in the section above. 2015 has been a spectacular year. We've grown our team of experts and staff, we've worked hard on your projects and case work and we've made great strides in improving the processes and systems that we use to deliver that work to you. From all of us at PFCS, we offer you a little holiday tribute. We'd love to hear from you about what you're up to this holiday, either what you're drinking, your toasts to the new year, or where you'll be enjoying the festivities. Comment on this blog for more holiday happenings. Get started now for a round of Sun Liquor Egg Nog, which our Information Technology department (Dylan Markow works remotely from Dallas, Texas) prepares around Thanksgiving (the Seattle Times recipe suggests aging the holiday cocktail one month in advance), to enjoy on Christmas. Combine the vermouth, bourbon whiskey, and bitters with 2 - 3 ice cubes in a mixing glass. Stir gently, don't bruise the spirits and cloud the drink. Place the cherry in a chilled cocktail glass and strain the whiskey mixture over the cherry. Rub the cut edge of the orange peel over the rim of the glass and twist it over the drink to release the oils but don't drop it in. "I will be literally “Rocking around the Christmas Tree” this year. Santa is bringing my daughter a mini Torino Red Stratocaster guitar and Daddy a new amp. We’ll be cranking it up! Wishing you all a Merry Christmas and Happy Boxing Day. Go Spurs!" "An Irish Toast – don’t have any Irish in me but I love their toasts." "Gratitude shouldn’t be an occasional incident but a continuous attitude." O'er the hills we go! "In New Year's Eve's past, I've been in Times Square for the big ball-drop. And I've danced in the new year at the Nines Hotel in Portland. And this year I'll be rockin' the Hard Rock Hotel in downtown San Diego. Maybe I'll see you there. Cheers and all the best for 2016." "For the Holidays, I will be heading up to Redding, California to visit my family. Friday we will celebrate Christmas morning at my parent's house and proceed to house hopping / crashing other Christmas parties until we end up at my grandparents' house for dinner. On Saturday, I believe we are going out to dinner to celebrate all of our birthdays (myself, my brother, and my dad all have the same birthday and my mom the following day). On Sunday, I will sadly depart back to Southern California where Monday morning shenanigans at PFCS will be waiting for me. No New Year's Eve plans just yet!" "Gather up your imperial forces, Christmas comes early this year for fans of the George Lucas mega-franchise that is Star Wars. For any science fiction fan, nerd or child of the 70s/80s, the anticipation is exciting to say the least. I'll be filling my flask with whiskey and lining up for the Star Wars movie marathon (7 films) punctuated with the new release of The Force Awakens. I'll be dusting my action figure collection with glee this holiday, and maybe heading back to the theater for repeat viewings." Project Coordinator Carolyn Des Jardin has had a stranglehold on the PFCS League of Awesome since Week 1 of the fantasy football season. As we cruise into the playoffs will she emerge the victor? For those partaking in the pigskin this season, good luck to your team, and we're all tuned in to see what happens in the NFL this holiday and into the post-season. I was putting together a new webinar called Slip, Trip & Fall Analysis for delivery on 12/17/2015, and thought a couple Sherlock Holmes quotes would be nice. So, as I often do, I turned to "The Google." Google led me to another one of my favorites, Wikipedia, which had a great Sherlock Holmes page with a bunch of great quotes. So many of these quotes are remarkably applicable to the work that we do, including the building inspection and construction management services that we call Building Lifecycle Management (BLM), as well as our Construction Claims & Litigation work. It is a capital mistake to theorize in advance of the facts. Work is the best antidote to sorrow. One should always look for a possible alternative, and provide against it. In solving a problem of this sort, the grand thing is to be able to reason backward. That is a very useful accomplishment, and a very easy one, but people do not practise it much. In the everyday affairs of life it is more useful to reason forward, and so the other comes to be neglected. There are fifty who can reason synthetically for one who can reason analytically. I never guess. It is a shocking habit — destructive to the logical faculty. You know my methods. Apply them. How often have I said to you that when you have eliminated the impossible, whatever remains, however improbable, must be the truth? Never trust to general impressions, my boy, but concentrate yourself upon details. We must look for consistency. Where there is a want of it we must suspect deception. We must not let him think that this agency is a home for the weak-minded. In the shrewd words of Mike Tyson... "Everybody has a plan... Until they get punched in the face." But let's be honest; not everyone has a plan. The State Bar of California: PFCS is an approved provider. All courses we offer are available for credit. California Department of Insurance: PFCS is an approved provider. Each program requires individual approval 30 days in advance. Application fee is $28.00 per course. Nevada Board of Continuing Education: Each program is applied for online with no application fee. Apply 30 days ahead to be safe. Oregon State Bar: Approval is applied for in advance, but can be approved up to 30 days after each webinar. Application fee is $40.00 per course. Community Associations Institute (CAI through CAMICB): PFCS is currently seeking approval for our Property Analysis Series. Colorado Supreme Court: Needs to be reviewed and updated. For more information, contact us at marketing@petefowler.com. For many contractors total customer satisfaction is the goal. But when it comes to construction, a client-controlled project is almost always a doomed project — not because the client is a control-freak, but because the client is not the professional. The contractor is. Thus the contractor should learn how to strike a balance by maintaining control of the project and producing something the client is satisfied with. There are two main ways a contractor can lose control over the project. One is by not taking charge themselves at the beginning. Being disorganized and unresponsive creates a vacuum of leadership, and the client rushes to fill that void. The second is by being too responsive—wanting to “wow” the customer by bending over backward with an extremely high level of service. Everyone, including the client, ultimately suffers from this anything-goes environment on the job. We need structure. And to create this structure, we need a good set of rules that are clearly communicated and gently but firmly enforced. They will vary. Eldrenkamp’s rules are: (1.) We’ll do nothing illegal, (2.) We’ll start only when we’re ready to finish, (3.) If asked to do more, we’ll charge more and take longer, and (4.) Our strength is our team. Whatever our rules are, they should be should be easy to remember, beneficial to all, and heartfelt—born of experience. This is one of my favorite articles, and I wish I had written it. Construction projects need leadership because they are executed by and for people. In any situation with groups of people working together, an absence of leadership always causes problems. Leadership means sometimes disappointing people. Clients are people and their expectations need to be managed. My personal experience is that this lesson extrapolates to circumstances outside construction projects. The first 100 words of the article can be found here. Anyone who then wants to read the full article must then purchase a subscription for access to the JLC archives. Warren Buffett is one of the richest and most famous people to have ever lived and he made the fortune himself. Buffett leads Berkshire Hathaway, a holding company that owns 76 businesses (See's Candies, Geico Insurance, Fruit of the Loom, NetJets, Pampered Chef, Johns Manville, etc. ), employs more than 250,000 people and is always near the top of any Most Admired Companies list. "... to reemphasize Berkshire’s top priority... that all of us continue to zealously guard Berkshire’s reputation. We can’t be perfect but we can try to be... We can afford to lose money – even a lot of money. But we can’t afford to lose reputation – even a shred of reputation. We must continue to measure every act against not only what is legal but also what we would be happy to have written about on the front page of a national newspaper..."
"... your associates will say 'Everybody else is doing it.' This rationale is almost always a bad one if it is the main justification for a business action. It is totally unacceptable when evaluating a moral decision." "There’s plenty of money to be made in the center of the court. If it’s questionable whether some action is close to the line, just assume it is outside and forget it." "... let me know promptly if there’s any significant bad news. I can handle bad news but I don’t like to deal with it after it has festered for awhile." "I need your help in respect to the question of succession. I’m not looking for any of you to retire and I hope you all live to 100. (In Charlie’s case, 110.) But just in case you don’t, please send me a letter giving your recommendation as who should take over tomorrow if you should become incapacitated overnight... Please summarize the strengths and weaknesses of your primary candidate as well as any possible alternates you may wish to include." I have read numerous books and articles on the subject of teaching and learning. There are a number of books out now, notably a best seller by Malcolm Gladwell (http://www.gladwell.com/) called Outliers, whose subject is human performance (he wrote Blink and The Tipping Point and all three were on best sellers lists at the same time). The research on expertise and human performance that many of these books draw upon relates to "Deliberate Practice." Attached are (1.) a short summary / update on Expert Performance and Deliberate Practice, and a 1993 scientific paper that comes up first when you Google "Deliberate Practice." There is an awesome Charlie Rose episode (12/19/08) on the subject that was half Malcolm Gladwell (http://www.charlierose.com/view/interview/9855) and half another guy name Geoff Colvin who wrote a book called "Talent Is Overrated" (http://www.charlierose.com/view/interview/9856). Scientists have now conducted many studies and concluded that in-born talent is, at best, a VERY small component in excellent (expert) performance and all top performers in any field are those who engaged in a special kind of "effortful activities designed to optimize improvement" called Deliberate Practice for approximately 10,000 hours over the course of 10 years. The scientists and these books argue that it is this Deliberate Practice which separates the best performers from the rest, not in-born gifts. They emphasize that years-of-service is not a differentiator in excellent performance, so lots of experience is not enough to make a great performer (i.e. expert). Deliberate Practice ("activities designed, typically by a teacher, for the sole purpose of effectively improving specific aspects of an individual's performance") appears to simply involve a disciplined cycling endlessly through (1.) performance, (2.) analysis of the performance, and (3.) modification of performance with the explicit intention of improving. Important note: marathon practice sessions don’t help. Ideal session durations are often an hour or less. Why do I care? I am trying to continuously improve my performance on several fronts: Business Executive, Manager (person-to-person), Father, Athlete, Musician, Teacher, in Personal Finance, etc... I think I can use this research to better design my "Deliberate Practice" to improve my performance in all these roles, as well as in design of teaching systems for my business. Putting this to work: Maximize the time we spend teaching or learning by using Deliberate Practice. Use the PFCS Strategy for Training: (1.) Tell them what the task is and why it is important. (2.) Show them how to do the task, modeling exactly what the trainee will be doing. (3.) Practice: Allow the Trainee to perform the task with direct supervision and re-direction during practice. (4.) Do with Feedback: Have the Trainee perform the task independently, then receive feedback and re-direction immediately following the performance. (5.) Do with Follow-Up: Have the Trainee perform the task independently, then receive feedback and re-direction at some scheduled future date. (6.) Repeat as necessary. (7.) Mentor: Have the Trainee become a training mentor for others. “Good follow-up is just as important as the meeting itself. The great master of follow up was Alfred Sloan, the most effective business executive I have ever known. Sloan… headed General Motors from the 1920s until the 1950s…” (During this time GM overtook the early leader Ford to become and remain the largest auto maker in the world until 2006). Also see: Effective meeting management by Peter Drucker. Our business is project based and every project is unique and has a new set of challenges for each member of the team. While a comprehensive project management system is an important tool set, getting the details right from day-to-day is done person-to-person. We have a meeting management method that everyone in the company is taught. It make meetings effective, offers a structure for delegating critical Action Steps, and has a built-in accountability mechanism. Our meeting agendas and minutes have 4 major components: Meeting information, Agenda, Minutes, and Action Steps (acronym M.A.M.A.). The heart of the system is to agree on SMART (Specific, Measurable, Assertive, Realistic, and Timed) Action Steps at the end of a meeting, and then paste those action steps into the agenda for the following meeting as old business to make sure that each has been completed. You say: "Bob, you committed to finishing estimate, is that done and sent?" A numbered, prioritized and organized list of all additional points that need to be discussed. The discussion can jump from item to item and out of order. Use these items as a check-list before the end of the meeting. Make numbered notes of what was discussed and decided. These numbers don't necessarily need to correspond to the Agenda numbering. Each Action Step should be discrete. SMART: Specific. Measurable. Assertive. Realistic. Timed. These will be pasted into the next Agenda as Old Business to ensure completion. Make sure everyone knows what good performance looks like.